Visiting art historians cast an eye over two very different historical eras in the Gallery’s collections. 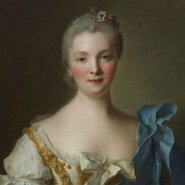 Professor Melissa Hyde from the University of Florida is the author of Making up the rococo: François Boucher and his critics (2006). Today, she takes us back to the 18th century, the era of Louis XV and Madame de Pompadour. Dr Jo Applin from the University of York is a specialist in American art of the 1960s. Join her to explore minimalist works by Donald Judd and his generation. This is part of the Third Sundays at the Gallery program, a State Street Learning for Life initiative.